ESPN will soon be the sole TV home to UFC — minus those dozen or so yearly pay-per-views, that is. The self-proclaimed “Worldwide Leader in Sports” just added 15 more fights to its upcoming rights package, which begins in 2019 and now totals a whopping $1.5 billion — or $300 million over 5 years, a person with knowledge of the deal tells TheWrap. That annual amount dwarfs what Fox Sports had previously been paying for all this UFC programming, which had averaged out to $116 million per year. ESPN now holds 30 Ultimate Fighting Championship events per year, 20 of which will be broadcast on the network’s new streaming platform, ESPN+, with the other 10 to air on the linear network. Those PPV events, which will not be exclusive to ESPN platforms, are booked about once a month. 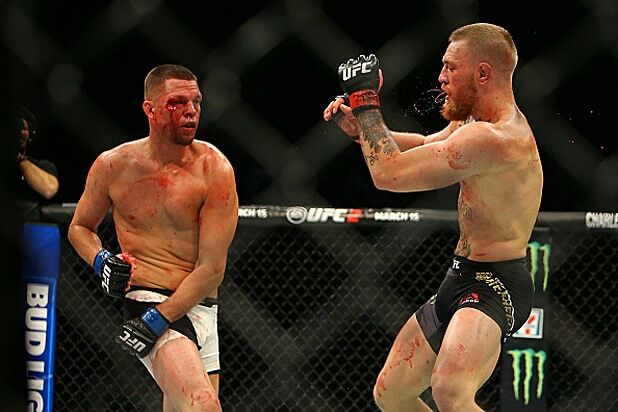 Combat sports rights are commanding tons of money these days. Fox Sports was originally expected to maintain at least a portion of its UFC rights going forward, but ESPN submitted the higher offer for the submission (and knockout) game. Fox’s contingency prize after losing out on the real fights was some very valuable fake (err, predetermined) battles: As TheWrap exclusively reported on Monday, Fox broadcast channel will begin airing WWE “SmackDown” on Friday nights beginning in Fall 2019. That deal, which will also span five years, is expected to put about $1 billion dollars in the collective pockets of Vince McMahon’s shareholders. Current “SmackDown” home USA Network will maintain WWE’s Monday flagship series, “Raw.” So, everyone’s a winner? We all just lived through another WWE Superstar Shakeup, and if your head is still spinning, we're here to help: TheWrap has tracked down where all 96 main roster wrestlers now work. In our tallies, we only counted regular in-ring wrestlers, so no managers or agents or wives or escorts, etc. -- even if they step between the ropes once or twice a year. Though we listed the obvious and current stables and tag teams together, we added up wrestlers individually. Readers can check out our "Raw" gallery here. The "Rusev Day" singer is pretty shredded and has a much better haircut now -- sky's the limit? "The Phenomenal One" is truly phenomenal, and that's why he has been the WWE Champion for a while now. Even their name is scary. Ty Dillinger may be "The Perfect 10," but "Cien" means 100. So you tell us who would win head-to-head. Her undefeated streak may be over, but the "Empress of Tomorrow" has a blindingly bright future ahead of her on "SmackDown." The "Irish Lass Kicker" is ready for another run at the title. No one mention Enzo Amore. No one mention Enzo Amore. No one mention Enzo Amore. It's a new roster, yes it is. So, ah, who wants pancakes? Ms. Money in the Bank is now Ms. WWE "SmackDown Live" Women's Champion. OK, so that's a bit of a mouthful, but she definitely has the belt -- for now. They don't just set the bar, they are the -- oh you get it. Charlotte Flair is the best women's wrestler that has ever lived, and yet she's on the "B" show. No, we haven't seen Y2J for a while, but he's technically on the "SmackDown" roster. Are these guys still selling timeshares in Puerto Rico? The tag team champs have cool outfits, huge mallets and (we think) a very stupid name. Why in the world did WWE break up the brothers Hardy like this? Anyway, Jeff is the one that "SmackDown" gets. Now HERE are two brothers that should never, ever be broken up. The Usos are probably the best tag team in WWE, and yes, they've been down since Day One-ish. Two guys that prove WWE is not always the best place for pro-wrestling talent. Will these two NXT imports replace the injured Paige, who is now their GM? Don't wrote off The Miz as a goofy reality show alum, this guy is a strong worker and a great talker. Feel the Glow, which is not to be confused with Netflix's GLOW. She's "Fearless," and now single again. Sorry, Nikki. What's up? We guess R-Truth is still an active wrestler. I mean, that's what the website says. The Viper will still strike you with an RKO outta nowhere. Joe has one of the better no-lyrics entrance songs in WWE, and probably its best scowl. We'll see what he can accomplish away from Chad Gable. His WrestleMania "dream match" against A.J. Styles was only decent, and Nakamura's new low-blow obsession is just kinda ... weird. The daughter of Jimmy "Superfly" Snuka is a bruiser -- and she's still going. If Will Forte dedicated himself to professional wrestling (and cornrows). In case you missed it, check out our "Raw" gallery here.